We are a manufacturer of industrial fans, a Polish company, which has over 20 years experience in the production of industrial fans. Fans are created from scratch, so we make sure that the components used in the production process meet the highest standards. As a result, our products are of the highest quality and functionality. From 01.07.2013r. 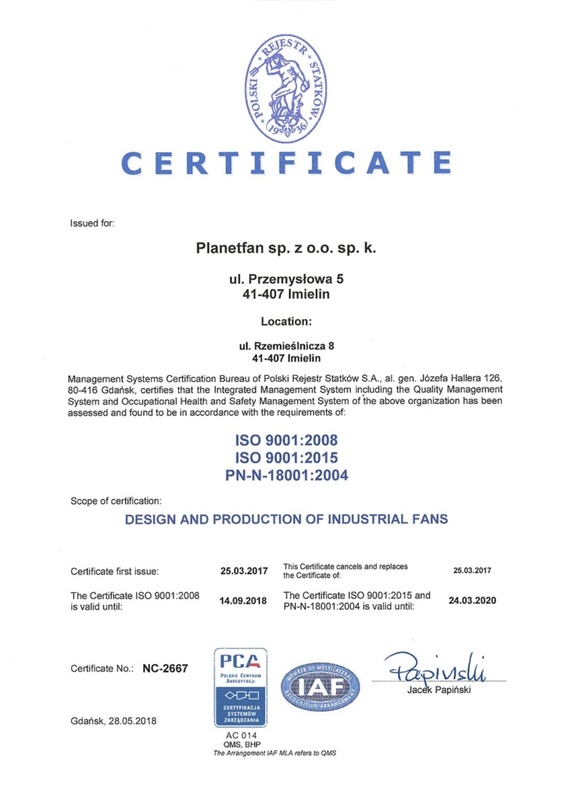 We focused on the development of production and specialization in the field of industrial fans under the brand name Planetfan. Our ultimate goal is the production Fans, meet the expectations of our customers. We make every effort to develop specialist production systematically improve their qualifications Professional Employees and HR management, both in terms of technical and customer service weight. Taking care of the repeatable quality of our products, we operate on the basis of certified Integrated Quality Management System and Safety. Regularly we modernize the machinery, expanding laboratory and construction department. We believe that both the level of service and the quality of our products, meet the expectations of even the most demanding customers. Thanks to our experience and our own laboratory back, in addition to production catalog undertake even the most difficult challenges, expanding existing areas of action both in terms of technical and areas. 1993. Establishment of fans Wentech Sp. o.o., to start production of cooling fans and industrial fans. 2003. Expansion of production of Wentech of compact cooling towers. 2009. Creation of an independent company, specializing in the production of industrial fans and cooling towers. 01.07.2013r. Chapter production of industrial fans and cooling towers. Department of fans continues to operate under the name Planetfan sp. z o.o. sp. k. , while the production department cold water begins operations as a new, entirely separate company.